Looking for the perfect vacation? An ideal place to escape the daily routine? Oklahoma has something for you. Come for a day, a weekend or even an entire week to take in some of these great places that are unforgettable and a change from the ordinary. Here are our 15 favorite perfect getaways in the state. The Colcord is listed on the National Register of Historic Places as it was the first skyscraper in Oklahoma City. The original marble columns and architecture have been preserved, but it’s a luxury hotel close to Bricktown, the Myriad Botanical Gardens, the OKC Museum of Art and the OKC National Memorial. While you’re in Oklahoma City, make plans to see the OKC Zoo, the Science Museum and Frontier City. If you’re looking for something a little more intimate in the heart of Oklahoma City, the Grandison is a bed and breakfast with eight different suites, each decorated in its own unique style. The Treehouse Hideaway is a whimsical room with a Jetta Tub for two under a skylight. The Anna Augusta room is a softer and more romantic bedroom with a corner fireplace and private bath. The floating cabins are a great way to experience the lake. You have access to the cabin via a dock. You are literally sitting on water when you’re in bed, in the kitchenette or in the living room. Each cabin has all the amenities you’d expect. While you’re in Ardmore, you can fish, visit the nature center, hike, take a boat out on the lake or play golf. WinStar is the largest casino in Oklahoma. It’s easily accessible off I-35 just north of the Texas border. Come for the games and entertainment, but stay for the spa retreat and shopping all under the same roof. Pine Lodge Resort sits on Grand Lake, one of the best places in Oklahoma to fish, boat and parasail. The resort is more rustic and is located back in the woods. You can enjoy a hot tub under the stars. Grand Lake has a lot of great attractions to check out when you visit, but the best time is from April through October. Price Tower was designed by Frank Lloyd Wright, and the top two floors are reserved as a hotel for guests. The inn is close to downtown Bartlesville, where you’ll find some great places to eat, including The Painted Horse and Frank & Lola’s. Bartlesville is a great getaway because the pace is slower but it has wonderful attractions and history, shopping and more. Located at the base of the Arbuckle Mountains, the Shiloh Morning Inn is a great getaway with opportunities to enjoy shopping, museums, nature and more in a romantic, secluded location. Stay in one of the suites in the large house or enjoy a private cottage of your own. More than a hotel or casino, The Artesian is a premier getaway just 90 miles south of Oklahoma City on I-35. Stay in one of the beautiful suites, take a dip in the indoor/outdoor pool and go shopping in one of the unique boutiques at the hotel. As Southwest Oklahoma’s best resort, Quartz Mountain is isolated enough to feel like an exotic retreat, but you won’t feel disconnected from the outside world because you’ll have all the amenities you need. Hike, fish, go to the Altus Speedway or just relax in the mountain air for the perfect weekend getaway. Come be a working cowboy for a few days and get away from the big city. With your accommodations, you also get all meals, including breakfast on the trail and cookouts. The lodge includes a poker table, 32-inch flat screen TV and Wi-Fi to relax after a busy day on the ranch. The Mayo Hotel is one of the best places to stay when you come to Tulsa for a getaway. You’ll be right in the heart of the arts and entertainment district, but only minutes from the Tulsa Zoo or the Oklahoma Aquarium. The hotel has years of history and is decorated in the Art Deco style, but offers all the amenities of a modern resort. Roman Nose is one of the original seven state parks in Oklahoma. Rent a tepee or stay in the more modern lodge for a getaway into nature. 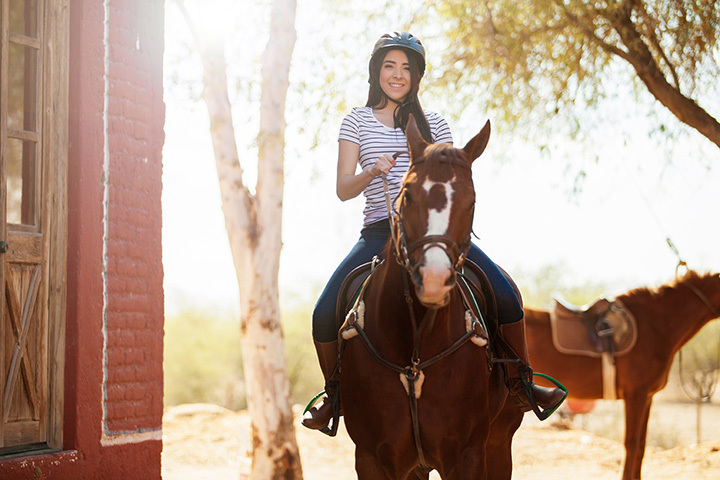 Hike, fish, canoe, bike or even take a horse ride when you come out to Roman Nose. Oklahoma is home to many rustic retreats, and Rebel Hill is another working ranch that offers a unique getaway. The cabins sit on the waterfront of a private lake and have picnic tables, full kitchens, satellite TV, central heat and air and more. You can go horseback riding, fishing, swimming and canoeing or just relax with a good book on your deck. One of Southeast Oklahoma’s best resorts, the Choctaw Casino has gaming and entertainment, plus laser tag, bowling, a spa, pool and shopping all under the same roof. Open year-round, you’ll find luxurious accommodations and dining when you visit any of the Choctaw resorts. Norman, Oklahoma is home to OU and during football season, the town is packed out with fans who support the Sooners. But there’s so much more to see and do in Norman. The Montford Inn is a secluded retreat with romantic rooms. Once you enjoy a home-cooked breakfast, head to downtown Norman to take in the Oklahoma culture. The Fred Jones Jr. Museum of Art and the Sam Nobel Museum are located on the campus and open to the public year-round.